Earth and Environmental Sciences doctoral student Amanda Daly was recently named a Presidential Management Fellowship (PMF) program finalist. The highly competitive two-year program connects finalists with participating federal agencies looking to hire exceptional advanced-degree candidates for what will potentially lead to a successful career in public service. The program is a good fit for Daly, who came to UNH in 2011 to study soil health and is interested in bridging the gap between scientists and the public and influencing agricultural policy. Her research focuses on finding solutions that will allow farmers to reduce the use of fertilizer and increase soil health and productivity. 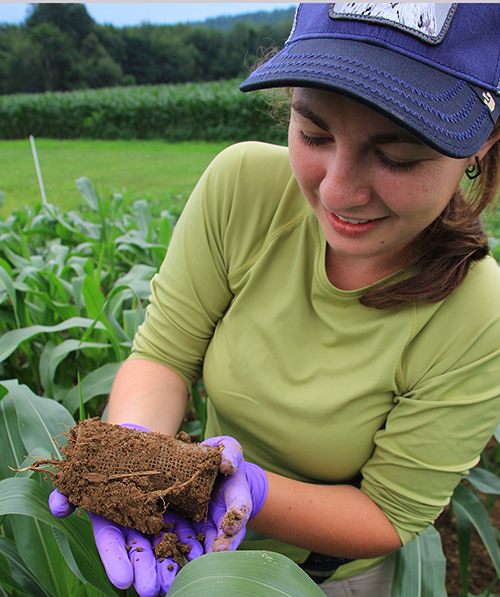 The more we learn about soil microbes, the more we understand how we should manage them — and often what we find changes how we define best farming practices. For the Moretown, Vermont native, the path to a career in soil science began with a small plot in a community garden she tended while working as a lab technician researching pediatric cancer and organ biofabrication at the University of Vermont (UVM). Her small garden, coupled with the influences of Burlington’s thriving local food scene, got her thinking about the soil where food is grown and how soil health affects agricultural production and sustainability. So, Daly consulted the head of plant and soil sciences at UVM, who helped her develop a list of researchers whose work aligned with her interests. She applied to UNH specifically to work with Stuart Grandy, associate professor of natural resources and the environment, NH Agricultural Experiment Station researcher and a highly regarded soil scientist. Grandy describes Daly as an invaluable member of his lab and an excellent mentor for the staff, which includes four other graduate students and, at any given time, an average of five undergrads. Awards are nothing new for Daly. She won a Dissertation Year Fellowship from the UNH Graduate School, a National Science Foundation (NSF) Graduate Research Fellowship and an NSF Graduate Research Opportunities Worldwide Fellowship, which allowed her to spend a year conducting research at the University of Vienna in Austria. Past achievements notwithstanding, Daly is amazed and excited about being chosen for the prestigious PMF program, which selects only 425 finalists from a pool of more than 6,000 applicants. She now has one year to find a job with one of the program’s participating federal agencies. Daly’s interest in influencing policy makes government an attractive landing spot professionally, but she hasn’t ruled out nonprofit work or academia. For now, all that matters to her is being able to make a difference, both for farmers and for the environment. “I can’t image not being involved in the public good with my work,” she says.